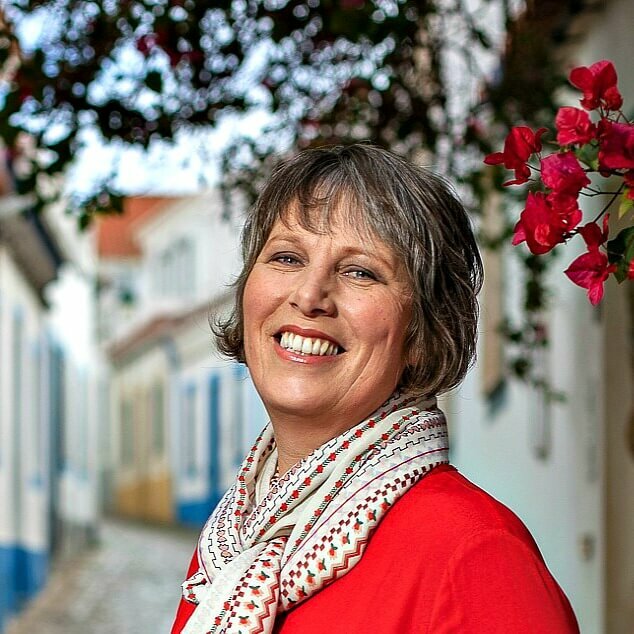 The heartbreaking tale of Pedro and Inês, Portugal’s ill-fated lovers inspired me to visit Alcobaça, a pretty town in the Silver Coast of Central Portugal. Pedro’s unwavering love for his forbidden sweetheart, Inês, who was murdered by his father’s henchmen, led to the exhumation of her body and posthumous coronation when he became king. He also ordered matching tombs to be built in Alcobaça monastery for their bodies. These magnificently carved stone coffins lie opposite each other in the nave of Alcobaça monastery, feet facing. The notion being that when Pedro and Inês wake up in the afterlife, the first thing they will each see is their beloved. It’s only a slight detour to reach Alcobaça on the route between Lisbon and Coimbra so Mike and I decided to spice up an airport run by visiting their tombs and the town. The monastery itself is an impressive example of Cistercian and Gothic architecture with plenty of interesting features and additions over the centuries. Even without the draw of the famous tombs it’s worth visiting, especially if you’re a fan of stonework. The church nave is simple yet dramatic with incredibly high columns supporting a vaulted ceiling. When we got there, the rows of pews were filling up for mass so we had to wait until the service was over to see the tombs in the transept. In the meantime, we explored the rest of the building, starting with the Room of the Kings. Standing on stone shelves high on the walls, above the hand painted azulejos depicting the history of Alcobaça monastery, statues of Portuguese kings provide a glimpse into changing royal fashions over the centuries. This room leads onto the cloisters where you’ll find all manner of stone carvings, sculptures and inscriptions as well as a beautiful Gothic fountain. Some of the rooms around the cloisters are open to the public, including one which is home to several angels and priests. The refectory has a tall thin door on one wall which the monks apparently had to fit through in order to gain access to the dining room. If they were too fat for the door, they couldn’t eat. I wasn’t about to humiliate myself by standing anywhere near it so I got Mike to do the honours. Bear in mind that he is exceedingly slim (some might say skinny) and even he’d have to approach the door sideways on to get through it! The kitchen is impressive to say the least. Built in the 18th century, it features a gigantic tiled chimney which dominates the centre of the room. Upstairs, the vast monks’ dormitory features a magnificent vaulted ceiling plus a viewing pane which looks down on the church so you can see the tombs of Pedro and Inês, as well as the congregation, during services. The upper cloisters are fun for gargoyle spotters. I saw crocodiles, monkeys and strange species of cat eagles poised to dispose of rainwater. A standard adult ticket is 6 euros but it’s free on the first Sunday of the month. If you’re visiting other monuments in the area, you can buy a combined ticket which will also allow you to visit Batalha Monastery and the Convent of Christ in Tomar for 15 euros. People come to Alcobaça by the coachload to visit the monastery and have a little wander around the historical town centre so it’s no surprise to find local restaurants capitalising on this. Prices are slightly higher than in most places and overly keen waiters will try to entice you into their establishments. We weren’t in the mood for a full heavy lunch and I will only eat the ubiquitous but dull tosta mista (cheese and ham toastie) in emergencies so we were both relieved when we stumbled across Estremadura, a cute little café at the far end of the main square offering light, imaginative lunches for a reasonable price. We had stuffed tomato, stuffed mushroom and hot lamb sandwiches. At night, it’s better known as a gin bar. Again, the heavy tourist traffic means souvenirs galore. 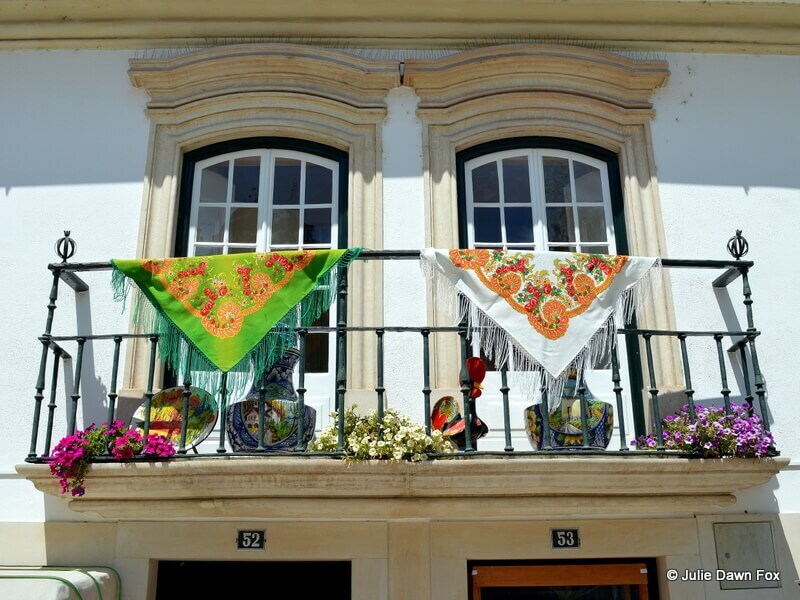 Every other shop on the main square and the streets leading to it has colourful ceramics, patterned shawls, cork handbags and other typical keepsakes. It’s not all tourist tat, though. Some of the shops sell original, quality crafts and quirky nik-naks. There was even an outdoor flea market behind the monastery when we visited. If you’re in the area mid-November, and have a sweet tooth, this is the place to be. Each November, Alcobaça hosts an international exhibition of pastries and liqueurs that originated in convents. Check the Facebook page for more information. 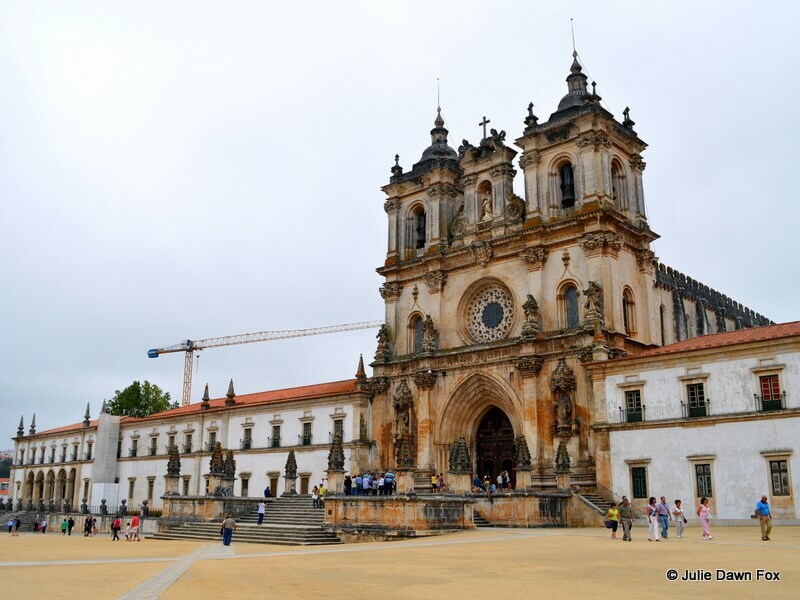 For other events throughout the year including classical music and jazz concerts as well as art exhibitions and conferences, check out the official Alcobaça Monastery website. The Portuguese version of the agenda is more up to date and detailed than the English one and with the help of Google Translate, you should be able to work out whether anything coincides with your visit. We’d had a ridiculously early start to the day with the airport run so by the time we’d had lunch and a stroll around the centre of town, we had no energy or enthusiasm left for museums. If you have more time on your hands, you might want to check out the Museu do Vinho (Wine Museum), which offers guided visits from Tuesday to Sunday at 11 am and 3 pm for 3.60 euros. Museu Raul da Bernarda hosts a permanent exhibition of fine ceramics produced in the Raul Bernarda factory and elsewhere in Portugal during the last century. Having been taken over by a folkloric organisation in recent years, the museum now features temporary exhibitions of ethnographic interest such as traditional dresses. 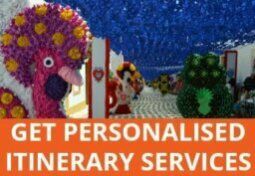 You’ll find it on Rua Frei Fortunato, entry is free and it’s open Wed-Fri 10 am to 1 pm and Wed-Sun 2 pm to 6pm (tel: 925651638). If you haven’t got a car (see this post for tips on renting a car in Portugal), you could take the bus from Lisbon but bear in mind you’ll need to change at Rio Maior and the journey is over 3 hours each way. Taking a private or small group tour would enable you to visit nearby places in the Silver Coast. 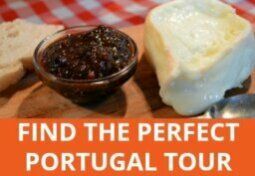 I like the sound of one that includes time in the pretty medieval village of Óbidos and a charming 19th century winery. This tour focuses on the UNESCO World Heritage monuments in this area. I think I’d be well and truly monumented-out by the end of a day like that! I’m also not that keen on visiting Fátima so I’d be inclined to go for one that takes you to Alcobaça, the beach at Nazaré, Peniche and the nearby medieval village of Óbidos. If you do fancy visiting the famous pilgrim city of Fátima, you might prefer this Fátima, Batalha, Alcobaça, Nazaré & Óbidos 10-Hour Tour. 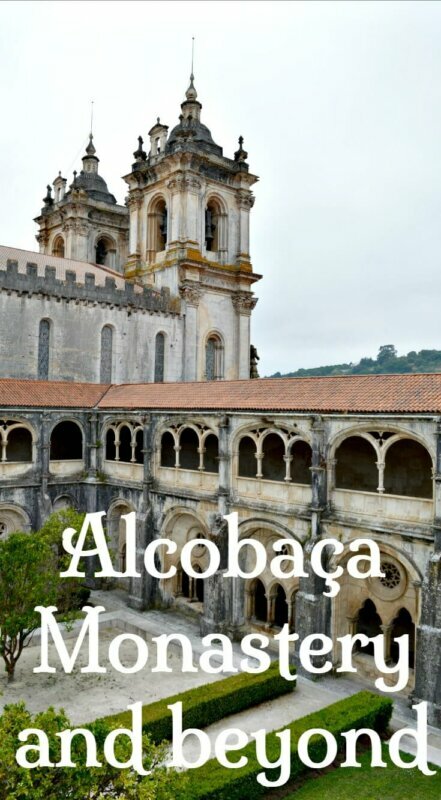 If you have a car, you could include Alcobaça in a Central Portugal road trip. If you decide to stay overnight, you have several accommodation options. 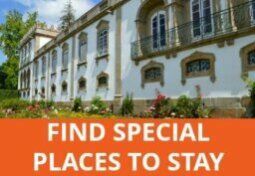 Solar Cerco do Mosteiro is but a few hundred metres from the monastery yet it has all the charm and character of a country house and its own orange grove in the grounds, as well as a swimming pool. Four poster beds, beamed ceilings and spacious rooms are typical features and there’s free parking on site. Choose a room, suite or apartment with monastery views. Challet Fonte Nova is romantic, stylish and delightful and a great example of what a small luxury hotel should be. There are rooms in the historical chalet and a new wing. Free parking, charming gardens and an onsite spa add to the appeal. See photos and check availability. Vale d’Azenha Rural Hotel is midway between Alcobaça town and Nazaré. If you prefer a modern hotel in a rural setting with an outdoor pool, mountain views, this is ideal. Choose a room with balcony or private villa. Like this post? Why not Pin It for later or share with your friends? We were there on a damp day in July, Julie and it was remarkably peaceful. I quite liked what I saw but we were just passing through and didn’t see much more than the monastery. We got there on a Sunday in August, just before lunch, so it was a bit busier. I imagine it’s fairly quiet throughout the off-peak periods, i.e. most of the year! I was completely ignorant of the story of Pedro and Ines until I came to live in Extremadura, right against the Portuguese border.A local town, Alburquerque, holds a medieval festival every year which is centred around the marriage of Ines and Pedro,which they insist happened in secret during her time in exile there. The unlikely story is that the townspeople kept their secret for ten years, until the couple were “shopped” by an outsider who stumbled across the secret whilst staying in Alberquerque.This all sounds a little far fetched when copmpared to known historical fact, but it provides a great basis to turn the clock back for 4 days. It is made even more improbable when the nuptials are always attended with great pomp by the King of Portugal! Like you, I had no idea how important Pedro and Inês are to Portugal’s history and how close to Portuguese hearts. It’s a fascinating, if tragic, story and as you already know, there are several versions and claims on the truth. I must visit Albuquerque during the festival one year and see it for myself. The festival is usually around the middle of August. I am very often the only non Iberian there! But I am used to that.